This is a great starter or backup charger that can charge up to 5amps. The red painted housing looks great and it's was customised exclusively for us. It’s a great charger that is safe and convenient. The charger features Lithium Cell Balancing. So each cell will be charged to the proper voltage level. This removes the chance of overcharging a cell, potentially resulting in a fire. The charger is quite compact. It plugs directly into a wall outlet and can also be used out in the field via DC power such as a 12V car battery. It can be used with AC wall outlets around the world since it can handle 100V-240V with its auto-switching power supply. It features an easy to use Button/Dial. Simply click the Button to select the battery type. Turn the Dial to your desired amperage. Hold the Button to start charging. The charger will stop when the battery is full. It can also charge NiMH & NiCd batteries too! 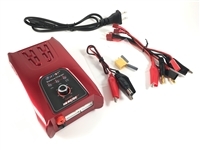 The charger offers 50Watts and 5Amps of charge power in a small, compact, easy to use package. This will ensure that your batteries charge fast! The H6’s goal is to provide reliability. HT-RC uses the best components on the market so that the charger will work, and work well for the customer. An internal fan keeps the unit cool in case it heats up. HT-RC offers a great 1 Year warranty on their chargers. This warranty covers manufacturers defects. This warranty does not cover end-user misuse or abuse. In the event of a repair/replacement the customer is responsible for shipping the unit to us in NY, while we will cover the cost of shipping the unit back to the customer.